Thanks for joining us here on the BBC Sport website. Congratulations to Motherwell, who are playing well under Northern Irish boss Stephen Robinson. For Aberdeen, they have the chance to put things right, in the Premiership at least, when they return to Fir Park on Sunday. All the best. Now, looking at those semi-finals, Hibs' tie against Celtic is likely to be on Saturday 21 October because Neil Lennon's men have an Edinburgh derby against Hearts on the following Tuesday. It would be rough on Hibs if they were made to play two such important matches within, um, 52 hours or so. Aberdeen manager Derek McInnes: "I'm not shocked about what we got from Motherwell. I knew exactly the type of game it was going to be. They play quick football, we've got to be ready for it. The first one came out of nothing. We should have dealt with it better before it came into the box but it was a mistake by big Joe. It gave them impetus. Hartley's header - I think Joe should save that one as well. There was plenty of effort but I think the team that was more aggressive won the tie and deservedly got through. Our delivery into the box was poor. The whole thing was unconvincing. I know my players; there's an honesty about them, they are hurting. Motherwell had the best player on the park." Motherwell manager Stephen Robinson: "We got that little break and we didn't look back after that. I think we have a great chance against Rangers. They are a big club with some super players and Pedro is starting to turn the whole place around but we'll worry about that later. "We engage our strikers early - we get the ball into their feet or their chest and we play diagonals and we play in their half of the pitch. Moulty's second goal epitomised everything about us. He didn't give up on it, he chased it down and that's the mark of his finishing capabilities. Peter Hartley has a reputation for scoring from set plays so we hopes he continues that. I thought we could have had a couple more - Allan Campbell hit the post and Moulty had a couple of half chances. We have a good team when they work very hard. If they don't work hard they won't be a good team - it's as simple as that." Quote Message: Aberdeen didn't have any control of the game, everything was rushed. Stephen Robinson put on Grimshaw to stop them getting any momentum. He will drop deep and you feel the space is huge and you can't get anywhere near him. I don't know when (Aberdeen midfielder) Greg Tansey's operation is scheduled for but I think it will be getting delayed again! Aberdeen didn't have any control of the game, everything was rushed. Stephen Robinson put on Grimshaw to stop them getting any momentum. He will drop deep and you feel the space is huge and you can't get anywhere near him. I don't know when (Aberdeen midfielder) Greg Tansey's operation is scheduled for but I think it will be getting delayed again! Quote Message: It was an awful night for Aberdeen. Derek McInnes will be bitterly disappointed. I didn't see many of the Aberdeen players up for the fight tonight. It started with Gary Mackay-Steven and went downhill. I'm talking about the physicality but take nothing away from Motherwell - I thought it was a superb performance from them. They closed Aberdeen down and didn't let them get into their stride and totally dominated them. They have blown them out of the water. It was an awful night for Aberdeen. Derek McInnes will be bitterly disappointed. I didn't see many of the Aberdeen players up for the fight tonight. It started with Gary Mackay-Steven and went downhill. 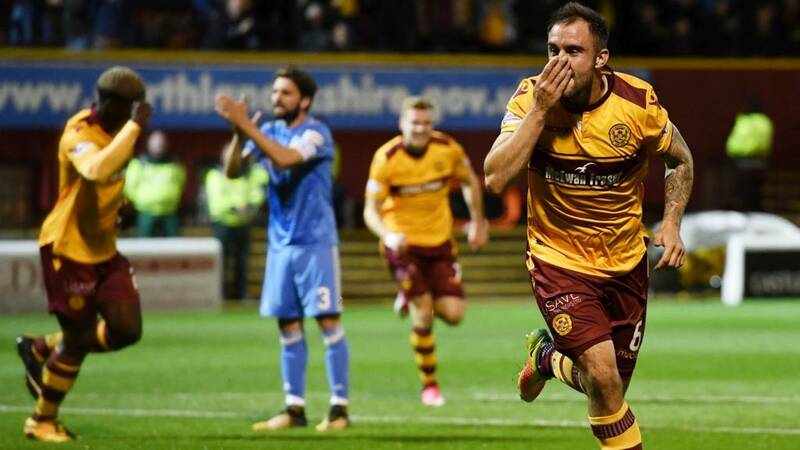 I'm talking about the physicality but take nothing away from Motherwell - I thought it was a superb performance from them. They closed Aberdeen down and didn't let them get into their stride and totally dominated them. They have blown them out of the water. Craig Tanner comes on for double scorer Louis Moult for the closing seconds. He is afforded a standing ovation by the ecstatic Well fans. Aberdeen forward Ryan Christie makes a rotten challenge on Richard Tait, possibly half an hour late. With the ball long gone, he seemed to stamp on his opponent's foot and certainly sent him flying. A yellow card seems lenient yet a red probably too harsh. Quote Message: Aberdeen have performed poorly but it's been a fantastic performance by Motherwell. They haven't allowed Aberdeen to get any rhythm or penetration. There are no gaps in the Motherwell defence and there is no width in the Aberdeen team. Aberdeen have performed poorly but it's been a fantastic performance by Motherwell. They haven't allowed Aberdeen to get any rhythm or penetration. There are no gaps in the Motherwell defence and there is no width in the Aberdeen team. Stevie Hammell, what a great pro he is, lofts a free-kick into the Dons box. The visitors clear the danger this time but they can only make it as far as the halfway line before ceding possession again, by way of a foul. Stevie May pumps his legs and cannot understand why he is not advancing across the turf. Only the peep of referee Kevin Clancy's whistle clears things up as Chris Cadden is shown a yellow card for pulling the Dons striker's jersey. It had the effect of one of those training parachutes sprinters put on their backs to add drag. I use cakes. Allan Campbell swivels on to the ball and cracks a shot from 15 yards, out on the right that beats Aberdeen keeper Joe Lewis, bounces off the far post, rolls along the goal line and bounces off the near post and falls into the arms of the incredulous, relieved Dons goalie. Campbell cannae believe it. Now, I know it's a school night but if you can hang on for a short while after the final whistle we can bring you the League Cup semi-final draw. In the hat, or glass bowl, are holders Celtic, Hibs and Rangers. Looks like Well will be joining them.